At the present time there are two very different types of processes being used to make synthetic emeralds. One, the flux-melt method, of which Chatham and Gilson are the main proponents and hydrothermal, the process used by Linde. Below are some examples of natural Emeralds and the two synthetic Emeralds on the market today. 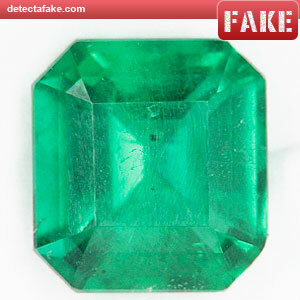 The above pictures are natural Emeralds. 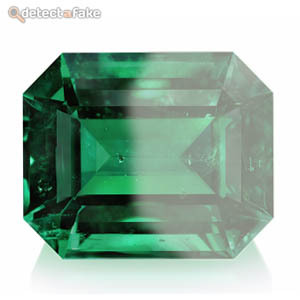 Almost all emeralds have eye-visible inclusions. Eye-clean emeralds are especially valuable as they are so rare and the presence of inclusions in emeralds is usually accepted by the trade and the consumer. Commonly found inclusions are crystals, fractures, needles, fingerprints, growth tubes, liquid inclusions, and two or three-phase inclusions. 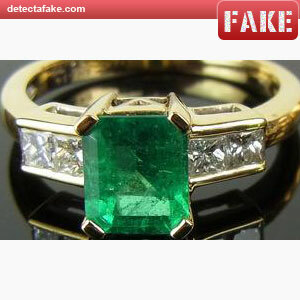 If you have an emerald with little or no flaws, you can assume it's fake. The two examples above are hydrothermal emeralds. 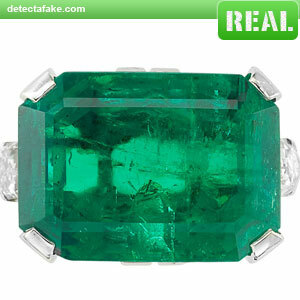 As you can see these synthetic emeralds are virtually flawless and easily identified as fakes. The examples above are flux-melt emeralds. 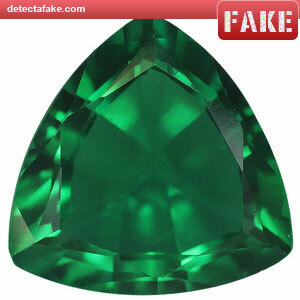 These synthetic emeralds are much harder to identify. There are two main things to look for in natural emeralds. The first thing to look for are tiny flaws or irregular patterns. Look for small natural holes or tiny deep lines especially in the backside of the gemstone, this is an indication that it may be a natural emerald. Another test you can do to determine a natural emerald is to apply oil to the emerald. 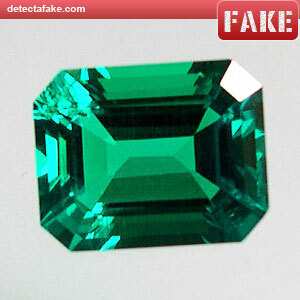 Clarity of natural emeralds can be enhanced by oiling but in a synthetic emerald, clarity doesn't change. Use these test as a guideline. To be absolutely sure, have your stone examined by a professional. Probably the easiest quick test is the "Breath Test" or "Fog Test". Very low tech but it works because emeralds are efficient heat conductors. Breath on it for about 1 second. If it's real, after about 2 seconds, you will see the fog evaporate. It will evaporate fast, in about 1 second. 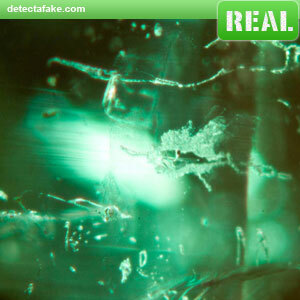 If it's fake, it can take more than 5 seconds to start evaporating and 2-3 to complete.